PUNE: Commissioner of Pune Police Rashmi Shukla and joint police commissioner Sunil Ramanand presided over a peace committee meeting at Khadak police station in the city in view of the ongoing Ganesh festival. The objective was to engage in dialogue and ensure smooth conduct of the 10-day festival, which started on September 5, and to ensure peaceful celebration of Eid-ul-Zuha, better known as Bakri Eid, which is to follow the Ganesh festival. Localities like Mominpura, Lohiyanagar and Kasewadi in the Khadak police jurisdiction have a large concentration of Hindu, Muslim population and people representing other religions. For years now, people in these localities have been celebrating Ganesh festival peacefully. The meeting was held to ensure that the tradition continues, police said. Members of peace committee, women vigilance committee, retired police officers, corporators, police friends and other community members were present. The Bohra community in Khada has been operating an ambulance service as well as free medical camps during the festival season. The medical camp began on Thursday, 8th September with a health check-up of 120 police officers. They were checked for blood sugar and blood pressure and those needing attention were referred. Saifee Ambulance is now providing medicines to the general public up until the end of the Ganesh festival on Thursday 15th September. The service is provided in co-ordination with Pune Dawoodi Bohra Jamaat with the day to day working handled by PR executive Mr Kuresh Ghodnadiwala. Volunteers from the community include the following; Mr Yusuf Limdiwala, Mr Mufaddal Tandiwala, Mohammed Maldeviwala, Mr Husain Jetpurwala, Mr Kasim Badami, Mr Haider Jetpurwala, Mr Ishaq Murtaza, Mr Hussain Dini, Mr Burhanuddin Limdiwala, Mr Juzer bhai and Mr Abbas Faize. The medical nurses are Ms Sakina Tandiwala, Ms Rumana Limdiwala and Ms Shabana Poonawala. 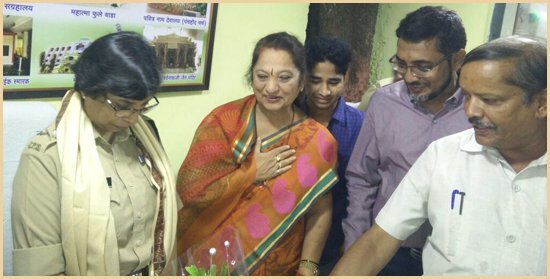 Dignitaries who were present at the inauguration of the service included Commissioner of Police Pune, Smt Rashmi Shukla, Pune Municipal Corporator Sunanda Gadade of Raviwar Peth area and SR Police Inspector Raghunath Jadhav of Khadak police station. ADMIN Copyright © 2017. All Rights Reserved.